I’ve been challenging myself to do as many things that are good for me as I can while I’m still in the bathroom in the mornings before the kids wake up. I’ve developed quite the detox ritual: coffee enema, detox bath, yoga, oil pulling, lymph massage, and supplements all usually happen while my kids are still asleep. It allows me to prioritize my health and gives me a great start to my day, plus ensures I don’t develop adrenal fatigue again. Some days, I turn my shower into a detox ritual, VS taking a detox bath. 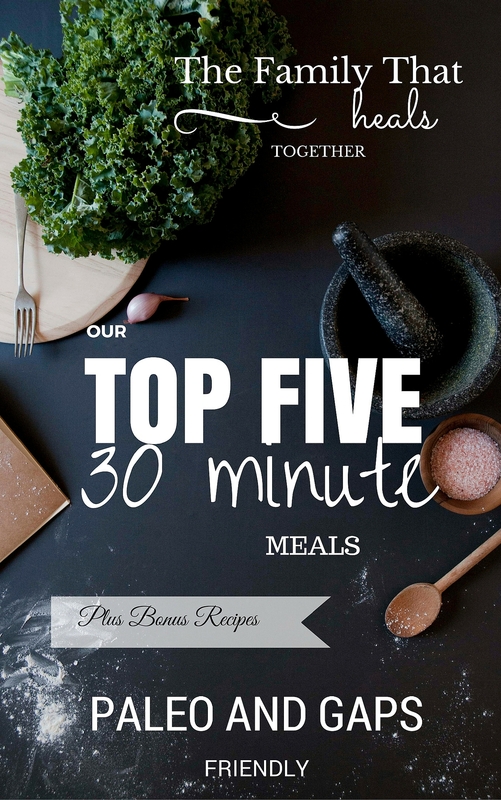 It’s super simple to add in a few things that can take my shower from an ordinary task to a wellness retreat, and it only takes about five extra minutes. As mamas, we have to sneak in self-care techniques wherever we can! I’ve got four busy boys, and though I haven’t always been well-rested enough to get up before them (high fives to the moms sleeping til the last possible second, when the kids are dragging you out of bed, begging for breakfast -didn’t they eat yesterday?- it gets better! ), I really rely on the time before they wake in the mornings now for “me” time. Multitasking is the way to go, especially for this busy mama, and, truthfully, sometimes I don’t even get my shower to myself, but that doesn’t stop me from implementing a few extra techniques that start my day off well and put deposits into my long-term health tank. 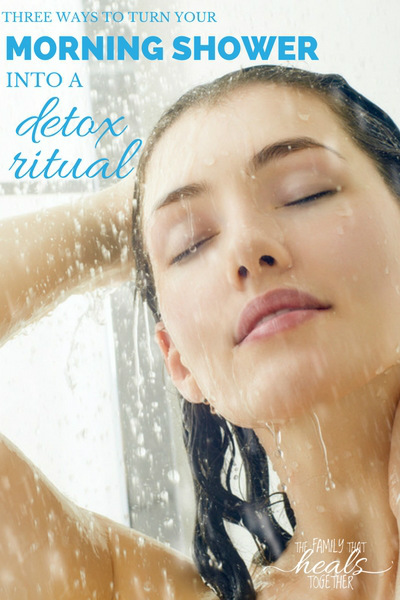 Here are three ways I turn my morning shower into a detox ritual. It’s so easy to pop a tablespoon of coconut oil in your mouth and swish it around. I keep coconut oil in my bathroom for lots of reasons, so it’s always handy (it also works wonderfully for my skin). For my morning detox ritual, I get to swishing as I’m jumping in the shower, and swish til my shower’s over. I use coconut oil because it is anti-bacterial, anti-viral, and anti-fungal, plus, I actually like the taste of coconut oil. I also love to add a drop or two of clove oil, which also has strong anti-pathogenic properties, plus promotes really fresh breath. To oil pull, I swish the oil in my mouth for about 10 minutes before spitting it into the trash can. Ideally, you should oil pull before you’ve had anything to eat or drink or have brushed your teeth. I follow up by brushing my teeth with Earthpaste. I told you about lymph massage in my post home remedies for sinus infections, but I love to use lymph massage as a preventative and to improve my overall health daily. Your lymph system is susceptible to toxic build up, and I’ve found that lymph massage can be helpful for headache remediation and prevention. By doing daily lymph massage, you keep the lymph flowing and from becoming stagnant. In the shower, I start with my neck, as shown in the video below, and work my way up to the jawline, face, sinuses, forehead, and scalp. I also like to finish by massaging my underarms, where lymph nodes often swell when there is an infection. I feel really energized and clear-headed when I give myself a lymph massage as part of my morning detox ritual. I learned recently about the benefits of taking contrast showers, which are purported to be one of the best ways to speed healing and detoxification. They are really simple to do, though they are uncomfortable. To take a contrast shower, simply take a very hot shower, then finish with cold water for the last minute of the shower. The contrast of the hot and cold waters promotes blood and lymph flow, by first dilating the blood vessels, then constricting them. While uncomfortable, it is definitely one way to wake up in the morning! I make it a point to cut down on toxins in all aspects of my daily life, so taking a detox shower in toxic water would be a waste. I make sure I’m showering in filtered water. Our family uses a whole-house black carbon filter, which filters chlorine and fluoride, plus a host of other toxins. You can easily purchase a shower head to filter these things as well. Try this one. Whether you have an hour or ten minutes, you can implement self-care techniques that will start your day off well and provide lasting health benefits. 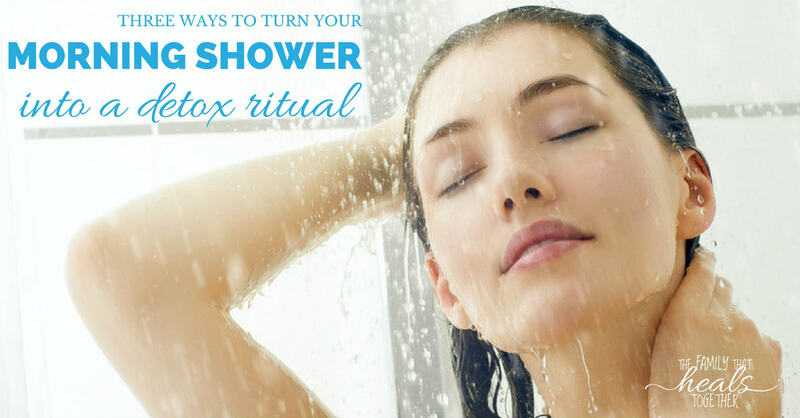 By turning your regularly scheduled morning shower into a detox ritual, you can kill two birds with one stone and feel good about putting deposits in your own health tank, which will equip you to take care of those around you better.